Everyone says, “sleep when baby sleeps.” But how on earth am I supposed to do that? My parents and in-laws were with us for the first year but now we are on our own. My wife is an artist and I am an occupational therapist. We set our hours so that one of is with him at all times. My wife at least can sleep while feeding him but I don’t have any chores that I can do lying down. When our son sleeps is the only time I have to get anything done at home! If I slept I would wake up to piles of laundry, nothing to eat, stacks of unopened mail, and no time to take a shower, let alone read a book or go to the gym. As this was one piece of advice I followed early and often, let me tell you how I did it. In order to sleep when baby sleeps, you need to work when the baby is awake. I have talked about this at La Leche League meetings and many people say that they wish they had heard this advice earlier, so I am going to try to spell it out. Have you noticed your son trying to grab your pen, spoon or any other implement you are using, and try get involved in whatever you are doing? Right about now is a good time to learn how to share some of your chores with your son. He will be only too glad to help. And I do mean “help.” It may take you longer to complete the task, but you will be utilizing the time when your son is awake, and keeping free the time when he is asleep. You will also find that you and your son will learn a few things not only about the work at hand, but also about each other. Consider this: when my daughter was a year old, I remember that she usually slept 12 hours at night and 2 hours in the day. That left 10 hours when she was awake. Eating, playing, bathing and going to the potty took at most half of that time. What would we do for the other five hours? Let’s get back to that to-do list of yours and see if we can’t cross some items off during baby’s waking hours. Note that even when your son is not helping you, you can carry him hands-free in a sling and go about your work while he is awake. His mind will busily absorb data about the habits of his species. This is why slings rank among the Resources for Continuum Learning. One-year-olds can help with laundry! Laundry: Laundry is great for kids, especially kids laundry which fits nicely into their little hands. Let them wash, dry and fold. If you have a machine, let them help load and unload. If you don’t have a machine, then the fun really begins. Let them swish the clothes around in the bucket, scrub them with a brush, squeeze out the water and hang them up to dry. This was one of our favorite was to stay cool during hot afternoons. Here is my one-year-old drying the clothes after one such washing session. 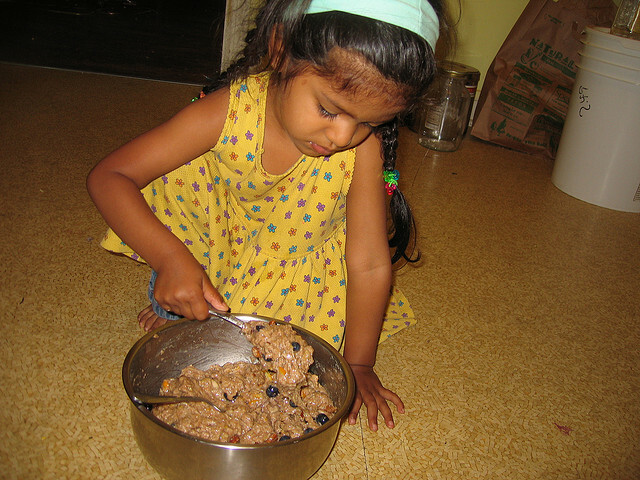 Food: Little ones can wash and sort vegetables, pour and soak grains and legumes, stir pots of soaking grains and legumes (didn’t you know they needed stirring ;-)? mix dough and even roll chapatis. Children who help prepare food have a better understanding of food and this enhances the appetite for fresh, home-made food. Kids love to mix dough! Gym: Even if you can’t go to the gym, you can still get good exercise while baby is awake (especially if you are doing the laundry by hand). There are workouts you can do with your baby, in some of which the baby serves as the weight that you lift. If the baby likes going out in the stroller you can get a workout either by jogging or strapping weights on while walking, or putting a baby seat on your bike and going for a ride. Bills and mail: If you have paperwork that requires only 5-10 minute spurts of attention at a time then this is also a good candidate for trying to get done while your son is awake. Maybe he can help remove the stamps, or shred the extra papers, while you fill out the forms and write the checks. Grocery & Errands: Learn to run errands and buy groceries while baby is awake. This is a nice opportunity for conversation as well as practicing the art of listening, knowing when to be quiet and observing the transactions in the world. “But my baby won’t be quiet!” you say? Don’t do too many errands in a row, and keep things interesting by talking to baby about what you are doing and where you are going. Give the baby a job to do such as weighing the tomatoes or crossing items off the shopping list. Reading: I agree, this is a tough one. If you can get books on tape you can listen while doing other things. Magazine articles also come in handy when you are letting baby help with the washing and you need something to do while you wait.